The CoLT-450 DSL test set. VICOM has announced new features and functions for the CoLT-450 DSL test set from Consultronics. The enhancements include through-mode/pass-through functionality, auto-test, multiple language support and the new user-definable negotiation time setting. The through-mode option allows the CoLT-450 to interface between a user's PC and the DSLAM, thus acting solely as a modem to collect and report DSL connection parameters including loss of sync (LOS) conditions, and ADSL frame/ATM cell information, to the user. 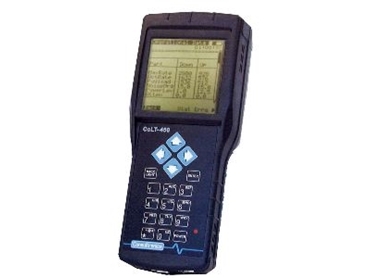 Results are shown on the CoLT-450's backlit LCD display and can be output to a PC for later retrieval and analysis. The auto-test function allows the user to test a customer's DSL service at the push of a button; from physical layer testing to network verification testing. The CoLT-450 will establish and report negotiated upstream and downstream data rates then proceed to PPPoE Login and finally perform a PING test. The auto-test includes limit checking to evaluate pass/fail thresholds that can be modified by the user. The CoLT-450's ADSL Annex A, ADSL Annex B, and SHDSL modem modules support these enhancements.